How to calculate equivalent morphine dosage when changing the method of administration? The calculation of opioid conversion is a crucial step in intensive care and is necessary throughout all the medical branches. Opioids (opiates) are a group of analgesic drugs, used primarily for pain management. They all interact with specific opioid receptors such as μ (mu), κ (kappa), and δ (delta) in the human body, but their potency and mechanisms of action differ significantly. Their dosage also depends on the chosen method of administration. It is common practice to switch the drug or the route of administration when specific drugs don't provide sufficient pain control or cause intolerable adverse effects. Opiate conversion is conducted basing on relative drug potency in equianalgesic charts. Remember to double check the results before administering any drugs to your patients. You might also be interested in our dosage, paracetamol, and ibuprofen calculators, or steroid converter. If you're a patient, consult a physician instead of modifying your therapy by yourself! The relative potency of opioids has been thoroughly examined in numerous scientific studies. The equianalgesic chart is a table presenting the results of this research. It usually includes information on the dosage, relative potency, and half-lives, compared to morphine. We used the equianalgesic chart from Wikipedia to build the opioid conversion calculator. Here is a table of substance dosage and potency, related to 10 mg of intravenously administered morphine. the daily dose for subcutaneous administration is 30 mg. Long-term exposure to one drug often results in the development of tolerance to the effects of other structurally similar drugs in the same pharmacologic class. Surprisingly, cross-tolerance between opioids is often incomplete. In practice, it means that after opiate conversion the dosage needs to be lowered, even by 25-50%. 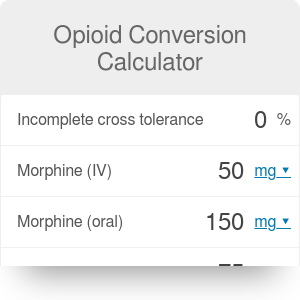 You can input this value in the incomplete cross-tolerance field in the opioid conversion calculator. Opioid Conversion Calculator can be embedded on your website to enrich the content you wrote and make it easier for your visitors to understand your message.